Between the cloudy, and rainy summer and the cold fall we are having, I’m thankful that we had a lovel evening to host our Tuscan Dinner Party. I’m not Italian and I’ve never been to Tuscany (except in the movies). I’m not even particular about party details in general. But I enjoy creating a table and environment that captures the essence of dining in Italy. You can read a little bit about my First and Second Tuscan Dinner Parties. The goal is to create a comfortable, outdoor eating area in which the food, friends, and conversation are the entertainment. I grabbed one of my coffee sacks and whipped up a table runner – mainly to help preserve my table cloth from wax spills since I bought some inexpensive candles. We set up the dinner under our deck, which my husband trims with lights, to create a cozy atmosphere as the sun goes down. The boys in the group were entertained the entire evening by the melting candles. r our wine barrel candle holder, so I put it on our side table. My friend made this Roasted Fruit Sangria. It sounds unusual to roast fruit, but it had just a hint of smokey flavor to balance out the sweetness of the drink. The grapes had a most unusual taste and texture – they were scrumptious! One of the additions I made to the table this year was the canning jars – a fun way to drink our Sangrias! I always try a new dish – risky business, in a way. 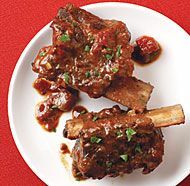 I have never made short ribs but have ordered out at restaurants. I cooked it the day before in my cast iron skillet. I covered it with foil and cooked it in the oven for 3 to 4 hours. I then put it a pot. The recipe says to reheat it in the oven, but I simply reheated on the stove top since there was so much liquid. To sop up the delicious wine-based liquid, the recipe suggests potatoes or polenta. My friend made a Grilled Polenta. I am not sure if that link is the recipe she followed. She created it ahead of time and then grilled it just before serving. It was delicious! I love the opportunity after a fun and busy summer to slow down and cherish time with friends. What else can I possibly say? Except I wish I could have been there! That came together beautifully! 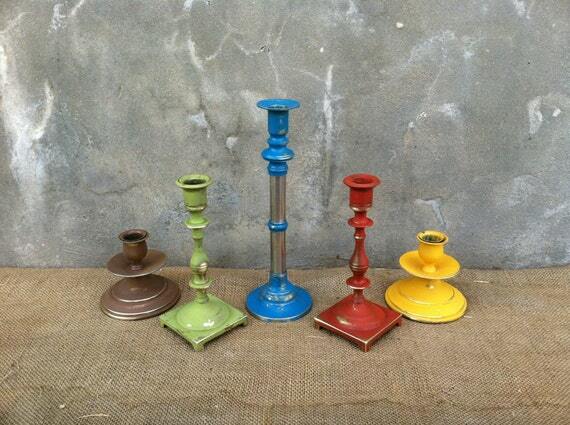 I’m especially enchanted by the candlesticks. Love the bright colors!